This recipe uses both oat and almond flour. If you have rolled oats at home you can make the oat flour yourself. Simply blend your oats in a high-speed blender until its fine and viola, you have oat flour. 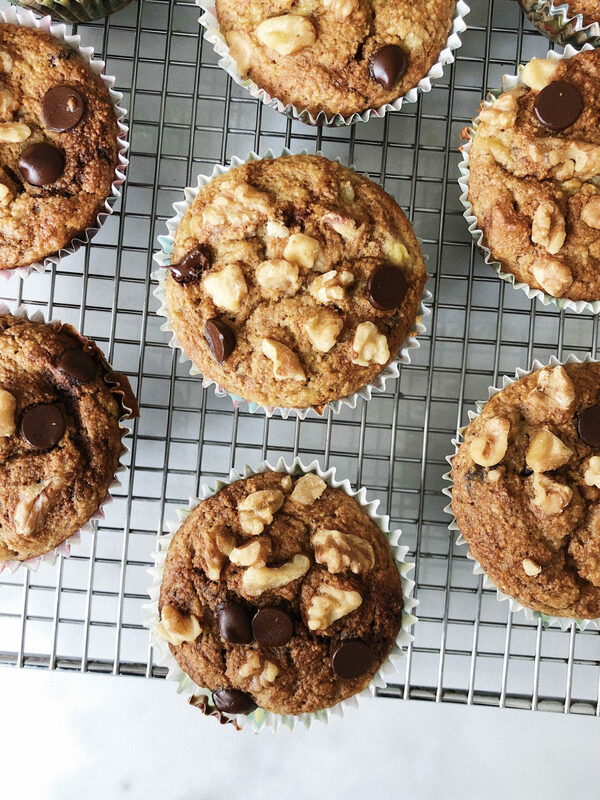 This recipe calls for walnuts and chocolate chips. However, you can omit either (if you’re crazy enough to omit chocolate) or replace with your favourite nuts, dried fruit, or seeds. Preheat oven to 350°. Line a 12 cup muffin tin with muffin liners. Whisk together the bananas, yogurt, honey, eggs and vanilla. Add the almond flour, oat flour, salt, and baking soda and mix until just combined. Stir in the chocolate chips and walnuts. Evenly distribute batter amongst the muffin tin. Bake for 25-30 minutes or until a toothpick inserted comes out clean. Allow to cool before enjoying! *You can blend 1 cup of rolled oats in a high-speed blender until fine as an alternative to buying oat flour. This entry was posted in Breakfast and tagged almond flour, banana bread, banana muffins, breakfast, chocolate, easy, gluten-free, healthy, muffins, oat flour. Bookmark the permalink.